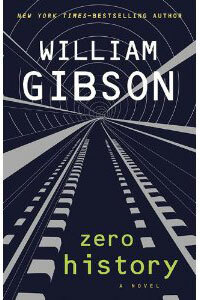 Usually, when I review for Shelf Awareness, my focus is on science fiction and fantasy novels, but when a galley of the new William Gibson novel, Zero History, I took advantage of Gibson’s SF background to call dibs, and my review appeared yesterday. I’ve been a fan of Gibson since stumbling onto Neuromancer as a junior high school student in the mid-1980s, although my fandom evolved to have some reservations; in the 1990s, for example, as much as I loved all the background details of the worlds he was creating, I felt like Gibson had a problem with endings, a tendency to hustle things along and wrap things up when the story reached a certain length. When I read Pattern Recognition, the first of his novels to be set in the contemporary/”real” world, I felt like he’d finally licked that problem, and I was deeply impressed with the ways he was redefining the thriller to reflect the political, economic, and cultural shakeups of the early 21st century in that book and its followup, Spook Country. Maybe Bigend’s comparative scarcity throughout the trilogy—he’s a lot more than a secondary character, but he’s never the primary character, if that makes sense—makes him more intriguing to readers (or at least a reader like me). Gibson clearly seems fascinated with the character both as a character and as a powerful force; I chose my “Bond villain” analogy deliberately—,and, in retrospect, almost certainly influenced by an essay Charlie Stross appended to his novel The Jennifer Morgue, “The Golden Age of Spying,” in which he re-imagines SMERSH as simply a multinational corporation ahead of its time: “venture capitalists investing in disruptive new technologies, in other words—commercial space travel, nuclear power, antibiotics. Not some half-baked terrorist organization!” And though there are a few aspects to Hubertus Bigend and his schemes that require a bit more suspension of disbelief than usual, I think one of Gibson’s biggest accomplishments in this series is Bigend’s ultimate plausibility—it’s not so very hard to believe somebody like him might exist out there (a Richard Branson who’d taken a few different turns along the way, perhaps?). You may not want to read all three novels too closely together, because of the plot similarities, but it would definitely be worth your time to familiarize yourself with the world Gibson has been describing in them.